After a short but good night sleep and an excellent breakfast, Mike Hichwa delivered his second keynote "RAD Challenge: Build a Real World application in 60 minutes”. 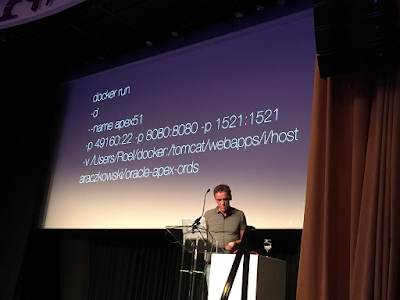 Although he suffered from connection issues, Mike managed to wow the audience showing the new packaged app "Quick SQL” and the new (currently Cloud-only) “Blueprint” option to create a new application. As JSON is not code (but just a collection of value-attribute pairs), it was really a no-code showcase! Then I had to deliver my second presentation “Docker for Dummies”. It was aimed at people who might have heard of Docker but really have hardly a clue what it is - and what the benefits are. I received really good feedback on this session and quite a lot of additional questions afterwards. So it seems I did made people curious and enthousiast about Docker. Mission completed! During another excellent lunch, we could still enjoy the beautiful weather and the Rotterdam skyline. It was good to spend some time outside in the fresh air. Then the last part of the event started. Dimitri kicked it off with “Moving my APEX app to the Exadata Express Cloud. Live!”. He explained the differences in (some of) the cloud offerings Oracle has and how you can move your application and data from your local instance into the Exadata Express Cloud. As Mike explained during his keynote on the first day, EECS will get better: more workspaces, really “Cloud first”, optional upgrading (after APEX 5.1), a local datacenter etc. Oh, yes, and a free subscription to the Oracle Developer Cloud Service as well! And finally, at the last keynote, Shakeeb could do his “The Center of the Universal Theme” presentation. Of course the presentation wasn’t just good looking - it had good content as well and I really like Shakeeb’s presentation style (as do a lot of other people I heard afterwards). As a “goodbye” we were offered some drinks and snacks and then it was time to go home. Next year APEX World 2018 it will probably be on the same wonderful location. I am already looking forward to it and i encourage everyone who is interested in APEX to attend!